I have been making this CILANTRO LIME RICE for about a million years. 😉 It’s just like the one from Cafe Rio and we absolutely love it. It is my go-to rice recipe, besides our beloved Mexican Rice, that I make any time we’re whipping up some Mexican food. Especially, on taco night. Kallen’s been on an anti-taco kick lately. I don’t know what’s come over my son but he despises them. It hurts my taco-loving heart, truly. So to make him happy I make him this rice. He totally loves it and will go to town on it! I love all the flavors in this rice. It has all the right amounts and hints of cilantro and lime. Yum! We’ll pile this inside our burritos and love to serve it in salads too. It really is delicious and kid-approved. Just fyi- I put extra cilantro on for the picture, but normally I just add the amount listed in the recipe and mix it in good. Thay way I don’t have my kids picking out ‘the green things’ the whole time. Ha! 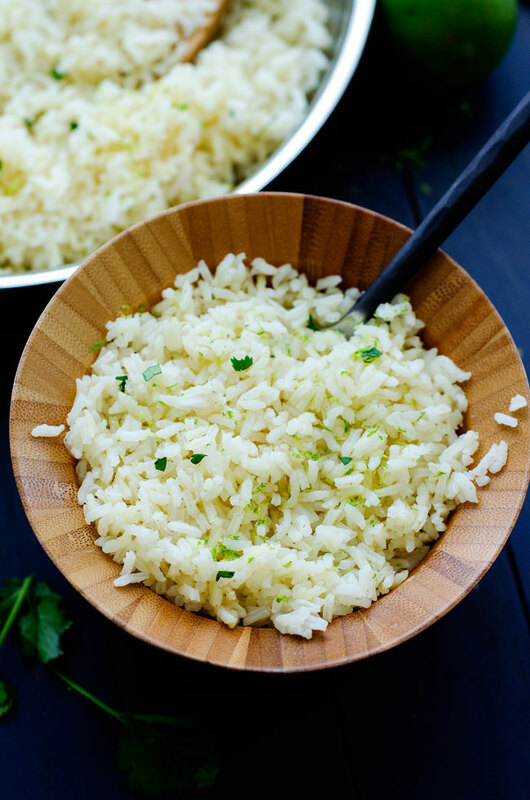 Fluffy and delicious rice with hints of cilantro and lime flavors! Combine the rice, chicken broth, salt and ground cumin in a large saucepan or skillet. Bring to a boil over medium-high heat. Cover with lid then reduce heat to medium-low. Let simmer 20 minutes. Remove from heat, but keep lid on. Let stand with lid on for 10 minutes. Remove lid and add in lime juice, zest and chopped cilantro. Fluff with a fork and serve warm! I love your comment about “green things”, my kids do the same!! Holly I want to let you know that my Cinco De Mayo dinner menu was from your wonderful website. I made your crockpot shredded beef tacos, cilantro lime rice (yum) and fried ice cream. My daughter and I loved every thing. I think the ice cream was our favorite. Thanks for all your great recipes. If it wasn’t for your website we would starve. Haha. I’m so jealous you’re going to Hawaii. Lisa you are so sweet!! Thank you for your super kind comment. 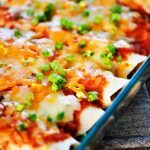 I am so happy all your Cinco de Mayo recipes were from my blog! All of those that you made are our faves 🙂 We are SO excited for Hawaii. I am literally counting down the days! Holly, I’m having a Taco Bar for my daughter’s graduation party and the Cilantro/Lime rice looks awesome!! Once it is cooked, how will it hold up in a slowcooker since we’re not planning a specific serving time, but “eat when you would like” arrangement? Thanks! Do you think I can make a day ahead of time and warm up next day? Yes, it is delicious reheated the next day! Do you think I can make one day ahead of time and warm up next day? 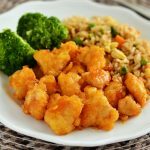 Can I substitute the white rice for brown rice? 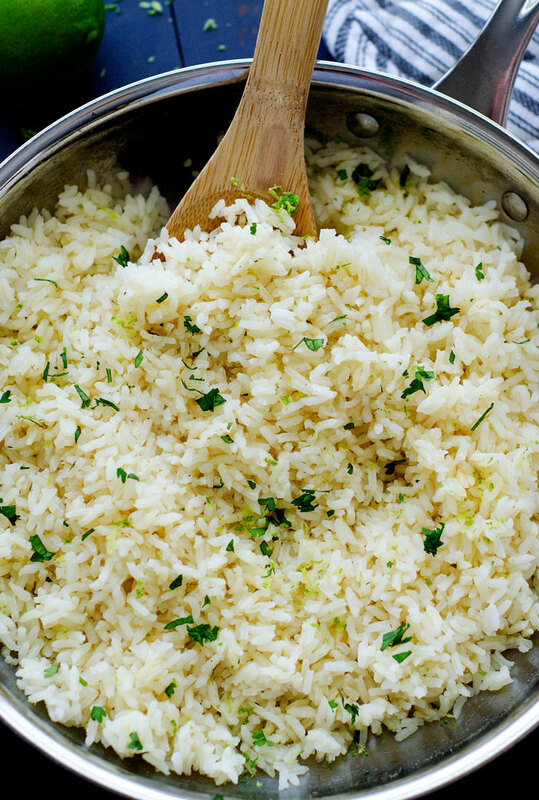 May be silly, but can you make the cilantro rice using brown rice? I haven’t tried it so not sure how it would be. Sorry! I made it with wild brown rice blend, and it turned out delicious! Thanks for the recipe! What if I used coconut water instead of broth? It makes the rice creamy, buy not coconutty. Do you think it would taste ok with the cilantro? I know the lime juice would work with the coco water. What is the best way to reheat this if I make it ahead of time? I just made this and the rice turned out sticky. Any ideas on why. I followed the cooking directions as stated. It still taste wonderful but was not fluffy. Do you think I can make this in a rice cooker? Hey Holly! This was amazing tonight! We were doing the whole, “No you have the last of it…”, “No YOU have the last of it” routine after dinner! Does it double well? Are you on Twitter? I was going to give you a shoutout there too but couldn’t find you. Thanks! This is too easy not to try! I loved your Mexican rice recipe, as well, but making both in the same meal might be a bit much. 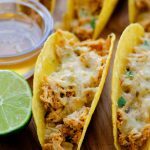 🙂 I’ve tried recipes that have a mile-long list of ingredients, and all I can think about is, “How can I make this easier?” I love Mexican rice, but finding a simple recipe as been difficult — until now. Thanks! Awesome receipe…. We love it!! Thank you for sharing it! Hi Holly, this recipe sounds delicious, thank you! When I click on the “print” button to print out the recipe, nothing happens. Anyone else had this trouble? 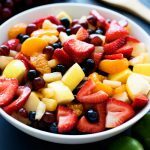 I found this site and recipe. Couldn’t wait to try it. It was the best rice I have ever made. It is a real favorite. I did change one thing, I used water with seasoning instead of the chicken broth as we are vegetarian. I have made it again for company tomorrow. Thank you for such a great easy recipe that everyone seems to love. Have you tried this with vegetable broth instead of water? Omg, just found this recipe, substituted veggie broth plus didn’t have lime juice so used half lemon juice half whit cooking wine. This is delicious . Best rice ever.